Background: Cancer continues to pose a great problem and burden on society despite new treatment options. While surgery, radiotherapy, and chemotherapy have led to major improvements in patient prognosis, newer treatments are needed to more effectively manage this disease in its advanced stage. Epidermal growth factor receptor (EGFR) is a receptor tyrosine kinase (RTK), which is catalytically active and under tight regulatory control. Dysregulation of its activity is strongly associated with tumorigenesis and cancer patients with altered EGFR activity tend to have a more aggressive disease, associated with a poor clinical prognosis. The family of EGFR has been intensively studied due to its strong influence on the formulation and deterioration of carcinoma. Thus, it is a good strategy that design anticancer agents by inhibiting the EGFR pathway. Methods: We group to obtain the six series compounds (8a-f, 9a-f, 10a-f, 11a-f, 12a-b and 13a-d). Hence we disclosed the design, synthesis and antitumor activity of novel quinazoline analogues against EGFR overexpression cancer cells A549 (human lung cancer), HepG-2 (human liver cancer), MCF-7 (human breast cancer) and PC-3 (human prostate cancer) and as well as the inhibitory on EGFR kinase. Moreover, apoptosis by acridine orange single staining and docking studies were presented in this paper as well. Results: Six series of quinazoline derivatives bearing 2,3-dihydro-indole or 1,2,3,4-tetrahydroquinoline (8a-f, 9a-f, 10a-f, 11a-f, 12a-b and 13a-d) were designed, synthesized and evaluated for the half maximal inhibitory concentration (IC50) values against four cancer cell lines (A549, HepG-2, MCF-7 and PC-3). Thirty target compounds showed moderate to excellent (1.49 - 50 µM) cytotoxicity activity against one or several cancer cell lines. The compound 13a showed the best activity against A549, HepG- 2, MCF-7 and PC-3 cancer cell lines, with the IC50 values of 1.49 ± 0.17 µM, 2.90 ± 0.24 µM, 1.85 ± 0.19 µM, 3.30 ± 0.22 µM, respectively. What’s more, the secondary amines were introduced to the target compounds to improve the water-soluble. The results showed that the compounds were beneficial to the cytotoxicity activity. Furthermore, the results prompted us that this series of compounds may be a kind of potential epidermal growth factor receptor (EGFR) kinase inhibitors. Conclusion: Six series of quinazoline derivatives bearing 2,3-dihydro-indole or 1,2,3,4- tetrahydroquinoline moiety (8a-f, 9a-f, 10a-f, 11a-f, 12a-b and 13a-d) were designed, synthesized and evaluated for the IC50 values of cytotoxicity against four cancer cell lines (A549, HepG-2, MCF-7 and PC-3). Thirty synthesized compounds showed moderate to excellent cytotoxicity activity against the different cancer cells. Especially, the compound 13a exerted antitumor effects in a dosage-dependent manner and the IC50 values of compound 13a were 1.49 µM, 2.90 µM, 1.85 µM and 3.30 µM against A549, HepG-2, MCF-7 and PC-3, respectively. From the antitumor activity data show that the compounds possessed selectivity for A549 and MCF-7 cancer cell lines. It meant that the compounds had better treatment effect on lung cancer and breast cancer. 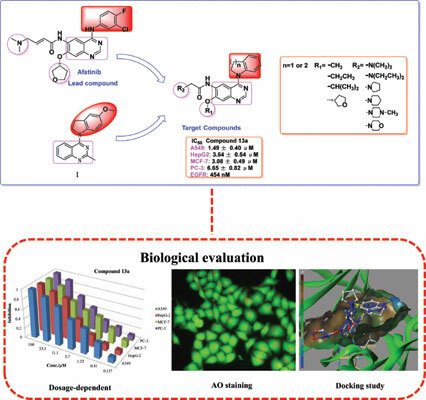 On the whole, the compounds substituted by 1,2,3,4-tetrahydroquinoline at C-4 position of quinazoline and (S)-tetrahydrofuran-3-ol at C-8 position of quinazoline were beneficial to the cytotoxicity activity. From the result of acridine orange (AO) single staining which indicated the compound 13a could induce apoptosis of A549 cells. From the result of Docking Studies, we hypothesized that the C-4 position of quinazoline were substituted by 2,3-dihydro-indole or 1,2,3,4-tetrahydroquinoline with the equal influence of the cytotoxicity activity. Overall, the results prompted us that this series of compounds may be a kind of potential EGFR kinase inhibitors. Quinazoline, 2, 3-dihydro-indole, 1, 2, 3, 4-tetrahydroquinoline, cytotoxicity activity, EGFR inhibitors, tyrosine kinase.